Professor James D Tabor, professor and chair of religious studies at the University of North Carolina at Charlotte, has inspected by robotic camera an apparently undisturbed first century tomb in Jerusalem. It contains limestone Jewish ossuaries, boxes into which the bones of the dead were placed after their flesh had decayed from them. Greek inscriptions and in some cases images suggested to Tabor that the tombs were Christian. Thus a four line Greek inscription on one ossuary speaks of God “raising up” someone, and a carved image on another ossuary could be a fish with a human stick figure in its mouth, an image evoking the biblical story of Jonah. The sign of Jonah, as mentioned by Jesus—according to Matthew and Luke but not Mark , the earliest gospel—is interpreted as his resurrection. Jonah images in later Christian art, such as images found in the Roman catacombs, are the most common motif found on tombs pesumed to be symbolizing the Christian resurrection hope. Jonah is not depicted in any first century Jewish art, and iconographic images on ossuaries are extremely rare, given the prohibition within Judaism of making images of people or animals. 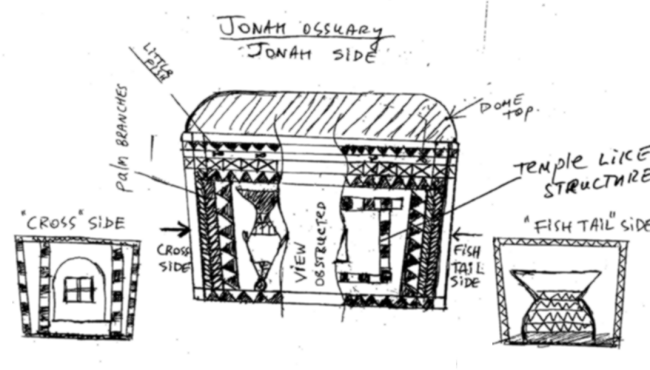 This Jonah ossuary is most fascinating. It seems to represent a pictorial story with the fish diving under the water on one end, the bars or gates of death, the bones inside, and the image of the great fish spitting out a man representing, based on the words of Jesus, the sign of Jonah—the sign that he would escape the bonds of death. 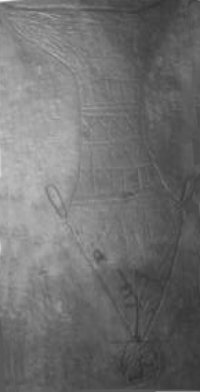 This inscription has something to do with resurrection of the dead, either of the deceased in the ossuary, or perhaps, given the Jonah image nearby, an expression of faith in Jesus’ resurrection. Everything in this tomb seems unusual when contrasted with what one normally finds inscribed on ossuaries in Jewish tombs of this period. Of the seven ossuaries remaining in the tomb, four of them have unusual features. a series of images on ossuary 6, including the large image of a fish with the stickman supposedly emerging from its mouth. If anyone had claimed to find either a statement about resurrection or a Jonah image in a Jewish tomb of this period, I would have said impossible, until now. Our team was in a kind of ecstatic disbelief, but the evidence was clearly before our eyes, causing us to revise our prior assumptions. The discovery is published in The Jesus Discovery: The New Archaeological Find That Reveals the Birth of Christianity , which Tabor has co-authored with the sensationalist film maker for The Discovery Channel , and now somehow, professor of religion, Simcha Jacobovici, as Tabor’s gushing enthusiasm shows. Simcha Jacobovici has made several pseudo-historical pot-boiling books and films before, including the Jesus Family Tomb, but none of them pass muster. He has been compared with Dan Brown, author of the novel, The Da Vinci Code , the significant difference being that Brown claims only to be a novelist. That Jacobovici approves of the comparison must mean something, but Jacobovoci seems to have fooled people who should know better He is the “Naked Archaeologist”, a self publicist and opportunist, not a scholar. Most proper scholars are skeptical of any Christian archaeological remains from so early a period. Moreover, this tomb is close to the tomb that Jacobovici sold to those willing to buy it as “The Jesus Family Tomb”. It too had in it inscribed ossuaries that had some of the names of Jesus’s associates or family, including one that reads “Jesus, son of Joseph”. These were common names at the time. Context is everything in archaeology. These two tombs, less than 200 feet apart, were part of an ancient estate, likely related to a rich family of the time. We chose to investigate this tomb because of its proximity to the so-called Jesus tomb, not knowing if it would yield anything unusual. The ossuary taken, that of a child, is now in the Israel State Collection. It is decorated but has no inscriptions. The archaeologists mention two Greek names but did not notice either the newly discovered Greek inscription or the Jonah image before they had to leave. The tomb was re-sealed and buried beneath the condominium complex on what is now Don Gruner Street in East Talpiot. The adjacent “Jesus tomb”, was uncovered by the same construction company in 1980, just one year earlier. It was thoroughly excavated and its contents removed by the Israel Antiquities Authority. This tomb’s controversial ossuaries with their cluster of names, seemingly gospel, are now part of the Israel State Collection and have been on display in various venues, including the Israel Museum. In 2009 and 2010, Tabor and Rami Arav, professor of archaeology at the University of Nebraska at Omaha, working together with Jacobovici, obtained a license to excavate the current tomb from the Israel Antiquities Authority under the academic sponsorship of the University of North Carolina at Charlotte. Because of its physical location under a modern building, making direct access nearly impossible, along with the threat of Orthodox Jewish groups that would protest any such excavation, Tabor’s team determined to employ a minimally invasive procedure in examining the tomb. Jacobovici’s team at the Toronto based Associated Producers used a robotic arm with high definition cameras, donated by General Electric. The robotic arm and a second “snake” camera were inserted through two drill holes in the basement floor of the building above the tomb. The team reached the ossuaries and photographed them on all sides, revealing the inscriptions. The Discovery Channel/Vision Television/Associated Producers provided funding. Needless to say, the speculation that these objects and their interpretation, even if it is correct, pertains to Christianity just a few decades after the supposed crucifixion is rejected by most rational scholars. Mark Goodacre blogs critically about these Discovery Channel sideshows. Another critical website is Tom Verenna’s. The possibility of such a connexion is more likely if the crucifixion was earlier, say around 21 AD, and it is even more likely if the allusions reflect the beliefs extant among Essenes. All this is discussed at the Askwhy! website. Mike I think your rhetoric is unfortunate here. It is one think for scholars to have honest disagreements and often minority views turn out to be right. The main thing is that we avoid the kind of language and pejorative labeling you use here and stay with the arguments. If you read through my blog: jamestabor.com, over the past few days you will see there is a legitimate discussion going on. The same on the sites asorblog.org and bibleinterp.com. Name calling has no place. This was a fully licensed and sanctioned IAA excavation with a major archaeologist, Rami Arav in the lead. Even archaeologist Yuval Baruch, no friend of Simcha’s and district supervisor of Jerusalem archaeology, has evaluated this new find positively. See the story in HaAretz. We published a substantial preliminary report you might take the time to read at bibleinterp.com before you put these sorts of post up. The internet is a free place and anyone can post what they wish but since you seem to be concerned with legitimacy, rationality, and proper academic procedure you might begin by practicing that yourself in both your rhetoric and the substance of your posts. I am not at all surprised that your skin is particularly thin over this issue. You seem to have been conned by a professional con-man. Regarding the archaeology, I have no reason to think that the procedures used in investigating the tomb are in any way disreputable. It is the interpretation that is disreputable, and that is what soils your own reputation. You say Yuval Baruch “has evaluated this new find positively”, but the Haaretz article you mention suggests that Baruch is rather cagey and reserved about it, his response being hesitant and conditional. He is reported as saying that Jacobovici’s work is “mostly unconnected to context”, that the photographs are “not in the best light” and so are “problematic”, and that “if it is indeed a fish, it is fantastic. It has no parallel”. True enough, but false scholarship ignores the important little “if”! 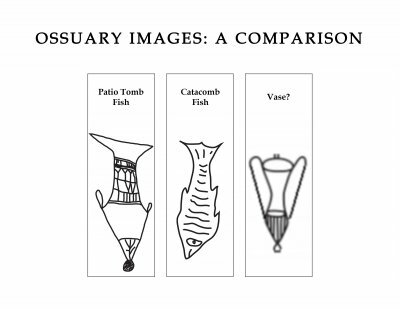 Baruch’s observation about context echoes your own quite proper statement, cited in the article above, that “context is everything in archaeology”, but here you are begging the question, assuming the context is Christian to interpret a scratched image of an amphora as a fish standing on its head! You are conning the unwary, believers particularly, that you have evidence here of early Christian burials when that is your own assumption. Rami Arav is reported as saying that “the fish cannot be mistaken for something more ordinary”, and “can only be understood as a fish and a human figure”, which is absolutely nonsensical. Ideally one should not begin with hypotheses but should let the hypotheses emerge from the evidence. So, it would be more cautious and less questionable to see the finds in the context of contemporary Judaism than begin with assumptions of Christianity, though the two merge, in my view, with the Essenes, and to see the tombs as being possibly Essenic, and to proceed from there would be more acceptable and fruitful than this approach. It is academic convention to always stay polite, but it is only a convention, and one which has not always been observed. It seems to me that it is far more important to be honest and admit without fear that a rotten fish stinks. Jacobavici is a sensationalist charlatan . If you want to understand what these symbols mean, you must first understand some basic ancient symbology. No one involved in this project seems to have a clue and thereby all assertions about symbols and their interpretations are without any factual support. 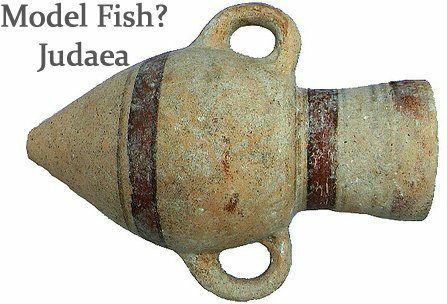 I will demonstrate that this image purposely portrays the merger of both a fish and a vessel and it is Hebrew, not Christian. To fully understand what this image represents, it must be viewed correctly with the “ball” at the bottom, just as it was drawn. Changing its position breaks the meaning of the symbolic code. Consider that the ball is the sun rising above the horizon at the spring equinox. The fish/vessel is the constellation Pisces, and thereby this shows the spring equinox sun, rising into Pisces, which is how you determine the current age on the zodiac. This image would then represent a zodiacal/astrological time stamp pointing to the second temple period, which was at the start of the age of Pisces. The fish thereby represents the constellation Pisces, and the vessel shape holds the “waters” of that age. Water symbolizes the flow of deeds through time, and a vessel holds a measured quantity of water (or other liquids like wine and oil). The measured period of time is the 2160 years of the age of Pisces, which ended in 2001. This image is a perfect symbolic code for the age of Pisces and the time and deeds (waters…) it represents. The symbology of that image is not Christian, but a time code pointing to the age of Pisces and related details. That is also the true source of the fish symbolism used by early Christians and later recast by Church leaders to hide the astrological source and associations with those most call the “Essenes.” Visit my website (http://www.sevenstarhand.org) and download a free copy of my ebook to learn the basic rules for this ancient symbology. They prove all previous interpretations are erroneous, though both a fish and a vessel were correct guesses. This image also provides key proof that Christian assertions about the fish and related symbology have always been blatant lies. I’ll publish more details soon. I’ll publish more details soon.